Just in case the Metal Gear Solid games were seeming conventional to you, the next one will include singing weapons. 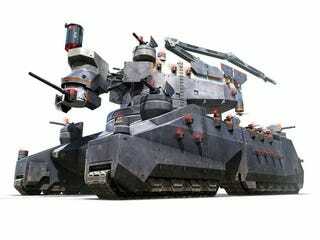 Metal Gear Solid: Peace Walker also introduces new AI Weapons - giant unmanned behemoths that Snake must overcome to complete his mission. These include hover, airborne, and tank-style vehicles. Each AI Weapon can speak and even sing during battle using VOCALOID technology, hinting at a surprising level of intelligence. The company also announced the inclusion of Mother Base, a hub area where players can amass and use soldiers they've recruited in the game to expand the base and "access new functions." Konami also indicated that the game will support three-vs-three battles over local wireless connections, in addition to the already-demoed four-player co-operative mode. I've included images of two of the AI weapons. I have no idea what kinds of songs they might sing.